Archaeological digs along the lower Salmon and North Fork Clearwater rivers are expanding what scientists know about the prehistory of the Pacific Northwest and may help revolutionize what is known about the first people to inhabit North America. VIDEO = Students working at an archaeological site near Coopers Ferry, Idaho, have made a series of videos about the work that can be viewed at www.youtube.com/user/CoopersFerrySite. To a large extent, that revolution already is under way. Recently published discoveries at Paisley Caves in south-central Oregon knocked holes into a long-held theory about the peopling of the New World. And an excavation at Coopers Ferry, near Cottonwood along the lower Salmon River, and another dig near the confluence of Kelly Creek with the North Fork Clearwater River, may bolster a competing theory about who the first Americans were and teach us about the way they lived. In 1997, Oregon State University archaeologist Loren Davis discovered a cache of stone tools at Coopers Ferry that, according to radio carbon dating, are more than 13,000 years old. This summer, and in future years, he and his students are expanding the site, which probably was a seasonal village, and looking for more artifacts. As they slowly work their way down through time and layers of earth, they hope to confirm the site holds clues that are among the oldest evidence of humans on the continent. Items in the cache included projectile points, tools for making stone points and raw materials for making the tools. “Sometimes, we talk about it in terms of ... an equipment locker somebody basically put in the ground, and they could come back and open it up and use it,” Davis said. “To be able to envision the use of the landscape from this place through the kinds of tools and features we see in the ground, that is exciting. “If ultimately, the bottom part of the site ends up being 13,000 calendar years old or older, it will be as important as Paisley, if not more important because Paisley Caves doesn’t have a lot of artifacts. It’s pretty lean on artifacts,” he said. But Paisley has proved to be rich in important data. 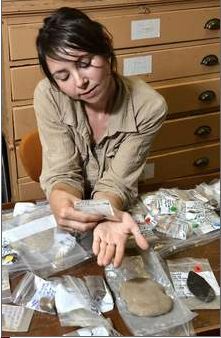 Davis is part of a team that meticulously documented human use at the site dating back more than 14,000 years. They discovered fossilized human feces known as coprolites more than 14,300 years old and a different style of projectile points, known as Western stemmed points, that are nearly 13,000 years old. The dates are important because the coprolites are older than any Clovis points found on the continent. While the stone points are not as old, they represent a different technology than Clovis points. A debated theory says the Clovis people crossed a land bridge between northeastern Asia and North America, and proceeded south from present-day Yukon to Alberta, Canada, and into Montana through a corridor between ice fields. They made distinctive projectile points, which were first discovered near Clovis, N.M., and have since been found in many places east of the Rockies. According to the “Clovis First” theory, these people were the first on the continent, and the ancestors of all Native Americans. Under that theory, all other styles of stone points descended from the Clovis tradition. But the evidence at Paisley, where Western stemmed points were discovered and no Clovis points were found, indicates otherwise. Western stemmed points have been found throughout the Northwest and the style correlates closely but not exactly to a style of weapons made by early people in northeastern Asia. Dating them to 13,000 years ago represents another problem for the Clovis theory, Davis said. At that time, ice sheets would have blocked the theorized route of the Clovis, but the West Coast of the continent would have been free of ice. At Kelly Creek, University of Idaho archaeologist Lee Sappington unearthed stone tools ranging from 12,000 to just a few hundred years old. 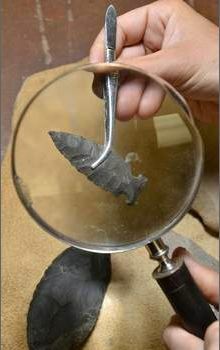 Artifacts uncovered include projectile points, stone knives and scrapers, fishing weights and tools called shaft abraders, which were used to make arrows and darts. The site probably was more of a camp than a village, but it was used over and over again for many generations. She will try to interpret the artifacts, when and where they were found, to paint a picture about the people who left them and how they lived. The dig uncovered tools made from a wide variety of sources, almost none of it local, which may speak to the distances people traveled to get there. Many of the points and scraping tools have tested positive for animal protein, indicating they were used to kill or process game. Lab work indicates the people hunted small game like rabbits and large animals such as moose and bison. The site is near the Kelly Forks Work Center, and the dig was funded by the U.S. Forest Service. Sappington said it’s unique because it is remote, most of it hasn’t been disturbed by past development and it is not going to be destroyed by something like a highway or a road. Many times, development leads to archaeological discoveries and the sites are excavated quickly before the artifacts are destroyed. In this case, Sappington said what wasn’t uncovered will be preserved.